Our Alaska Airlines flight departed 7:20am from Newark, which meant going through security at what is (for me, anyway) the ungodly time of 6:40am. Fortunately we were able to wake up at 6:15am, thanks to being at the Newark Airport Marriott, just minutes away. I didn't spot our gate right away, and perhaps it was a fluke, but the Alaska flight seemed to be completely missing from the departure screens. I finally asked another gate agent where our flight was departing from, and she pointed me to the correct gate, where we boarded. Our Alaska Airlines flight was on a 737-800, with 8 first class recliner seats, and the munchkin and I were in seats 2D and 2F. 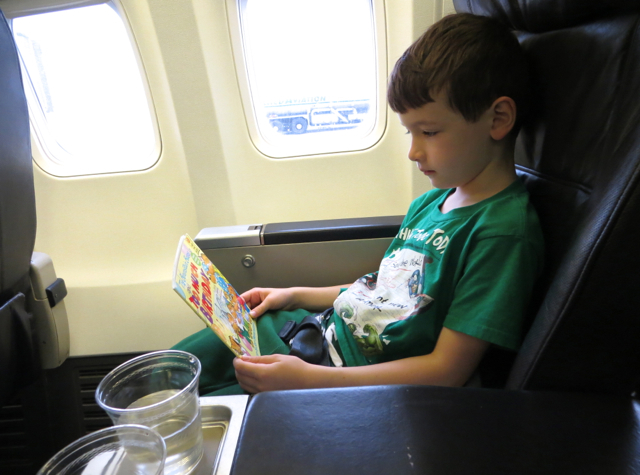 The munchkin busied himself reading one of his Bernstein Bear books, while I took a photo of him and of the first class cabin. Both the munchkin and I were a bit tired from not having gotten enough sleep the night before, so the munchkin wanted to make his seat into a bed–no dice, of course, since these were recliner seats. Which would be fine for a 2-3 hour flight, but both of us were more than ready to get off the flight once we reached Seattle, finding them pretty uncomfortable in our tired state. 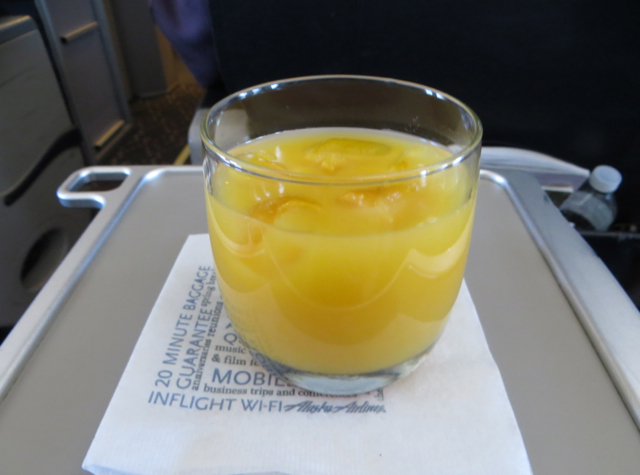 The flight attendants, who were friendly in welcoming us aboard, offered us orange juice or water as our pre-flight drink, and both the munchkin and I had some orange juice, since we knew it would be a little while until we were airborne and offered breakfast. We took off on time (Newark is notorious for delays, so if at all possible, I recommend taking early morning flights out of EWR before flights get backed up and delayed, even if you're not a morning person). 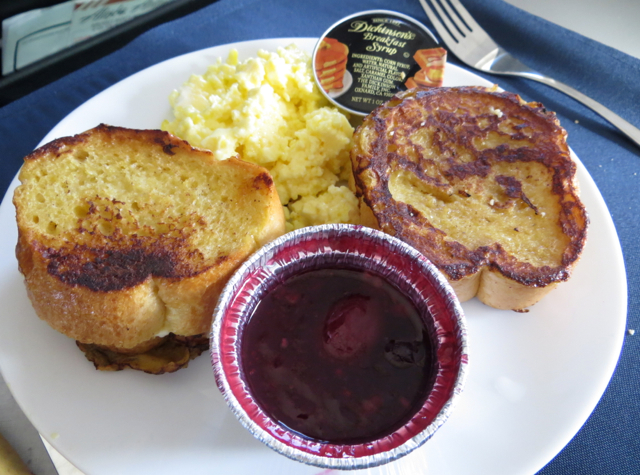 Once we were airborne, the flight attendants came round, apologized for the lack of a breakfast menu (they had a dinner menu, which obviously didn't match what was catered for the flight), and offered us a choice of scrambled eggs with ham and potatoes, or french toast with cream cheese and cherry sauce. No question the french toast sounded better, but for the sake of trying both, I asked for the egg dish, and the munchkin happily ordered the french toast. Before the breakfast entrees, we were offered fruit plates. While nicely arranged, neither of us enjoyed them much, since they were mostly cantaloupe and melon, which neither of us likes. There was a bit of mango, so the munchkin ate his, as well as mine, plus the lone strawberry, and I ate the kiwi. There were also warm scones and muffins, which the munchkin enjoyed, but I'd say the quality was worse than Starbucks, so unless you're desperate for carbs, don't bother. As I predicted, the egg dish wasn't very good, but I ate it anyway since I wanted the protein. 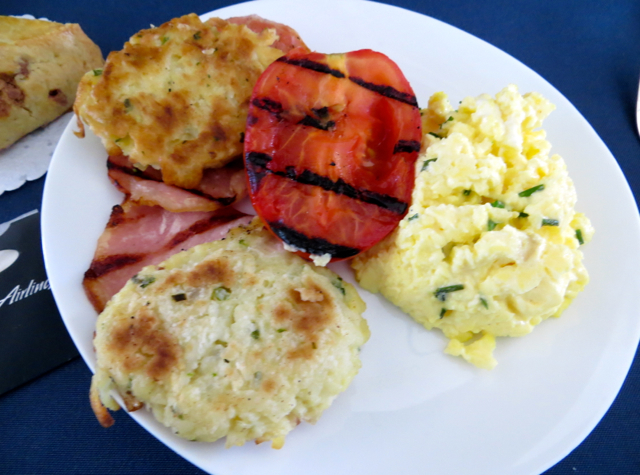 At least the eggs were cooked thoroughly, so in that regard, much better than the eggs at the Park Hyatt Paris Vendome breakfast. The ham was ok if you like your meat ultra-processed and salty, but the potatoes were barely edible. Fortunately there's not too much you can do to ruin a simple grilled tomato, so that part was fine. The munchkin's french toast was decidedly the better choice. It wasn't brioche bread, but the cream cheese filling paired with the cherry sauce was nice, and there was absolutely no need for the artificial Dickinson's “maple” syrup also served alongside. 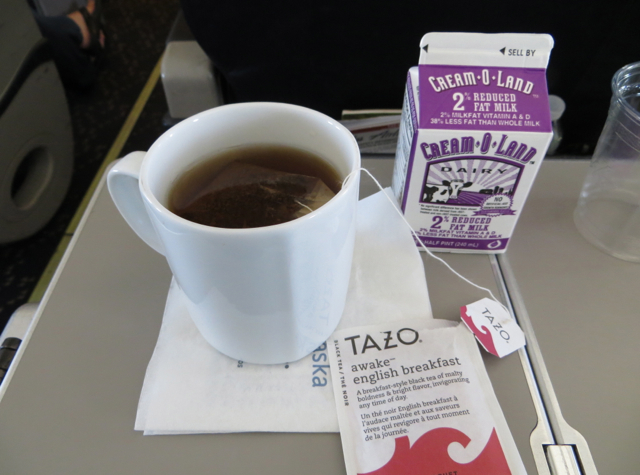 After the meal I asked for tea with milk, and was brought some Tazo English Breakfast with a carton of milk. That and the french toast were the most satisfying aspects of the catering, as far as I'm concerned. 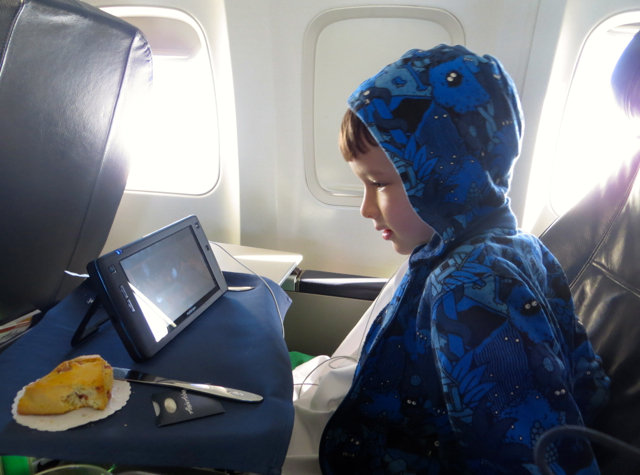 During the meal and afterwards, the munchkin had fun watching some of the Disney movie Ratatouille on the digEplayer that is passed out complimentary to Alaska Airlines first class passengers, and available for rent in economy. I have to say it's weird not to have personal IFE systems in the seat back or available from a screen folding into the armrest, and the screen of the digEplayer is quite small. Or maybe I just have unrealistic expectations because I almost never fly domestic and our last flight was in Asiana First Class Suites. In any case, the munchkin soon tired of the available kids' programs, and I was glad to have brought both books and his own favorite DVDs and a DVD player with us. 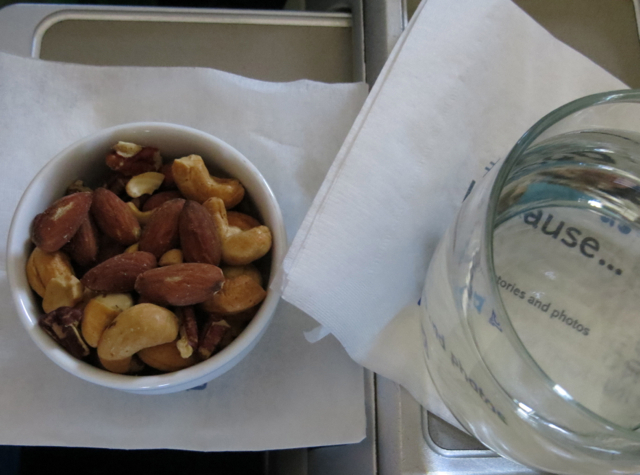 Towards the end of the flight, we were offered mixed warm nuts as a snack. The Verdict: I knew of course that the Alaska Airlines first class seats were recliners, but the lack of recline and just how uncomfortable they are make me wonder why anyone bothers flying Alaska Airlines, even in first class, if there's a choice of carriers on the route. Let's just say I was not happy at all with the hard product. The soft product, that is the service and food, were better. 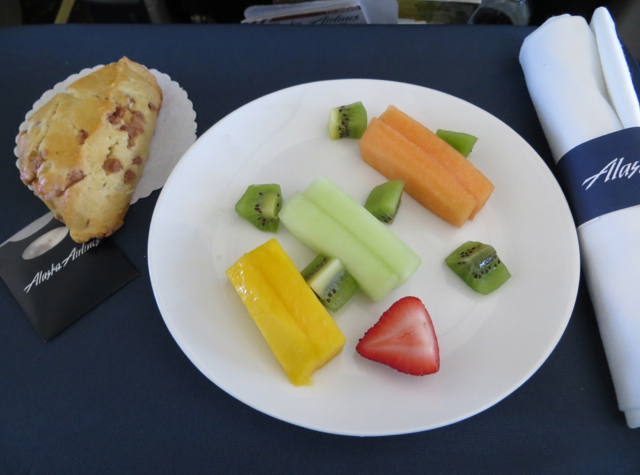 The service was friendly and cheerful, and the best aspect of the flight. 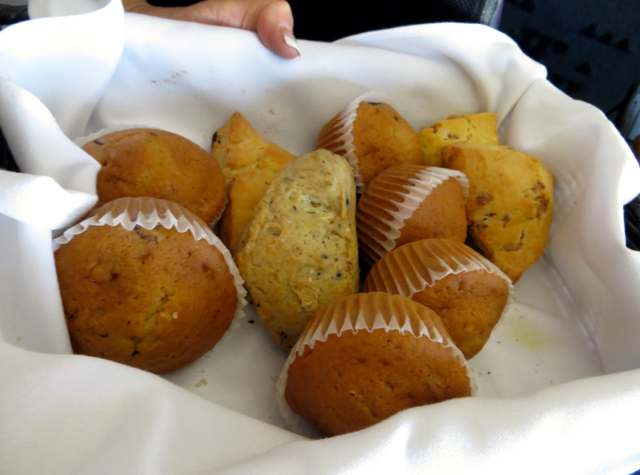 The catering is pretty much what you'd expect for a U.S. domestic flight, ranging from barely edible to quite good. 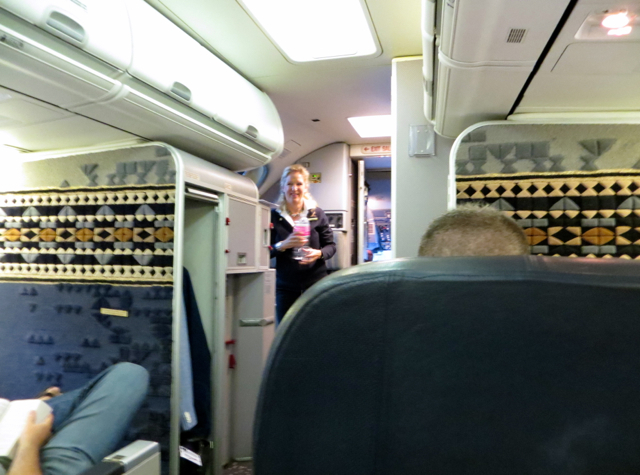 If you've flown Alaska Airlines First Class recently, what was your experience? Need Award Booking Help? Our fee is as low as $75 per ticket if you book your hotel or cruise through us.